Goblin Skulls & Shackles, Session 6 – Sneaksy, Tricksy, Murderers! As Man’s Promise continued its course away from that ordered by the Wormwood’s captain, whispers circulated among the crew. Fishguts Kroop speculated that Mr. Plugg and Master Scourge could be taking Man’s Promise to Rickety Squibs, a dry dock used by pirates to refit their ships to change the lines and silhouettes. The only reason they’d be going against Captain Harrigan’s orders by going there was to set themselves up as independent pirates; Kroop thought they might be trying to make a name for themselves. While it seemed reasonable to some of the other humans, the goblins weren’t convinced. They did know, however, whatever Mr. Plugg’s and Master Scourge’s purpose was, they still hated the goblins (the feeling was mutual). With a skeleton crew and no Wormwood in sight, it seemed the time to make some changes had come. Brodo Faggins, Spack Jarrow, and Sandara Quinn moved around the crew as they slept, locked below decks, while Ent Cleastwood and Garagornne kept a sharp eye out. They spent the evening garnering support among the crew, killing two of the former Wormwood crew who seemed to support Mr. Plugg and Master Scourge, or at least, who failed to show enthusiasm for replacing them. Brodo Faggins picked the locks keeping them in the hold and sneaked up to the main deck. The rest of the crew were asleep as Man’s Promise drifted. With a skeleton crew, there weren’t enough to spread around to multiple shifts. Brodo, Garagornne, and Ent sneaked into the Captain’s cabin while Spack Jarrow and the rest of the loyal crew waited for the signal. Mr. Plugg and Master Scourge were both asleep, confident in the locks’ ability to keep the crew where they put them. Mr. Plugg was the first to learn the folly of his ways as Brodo opened his throat. So swift was Brodo’s attack, Master Scourge’s sleep was not disturbed. He too, fell to a blade in the dark. After seeing how quickly and easily the two feared men were dispatched, the former Wormwood crew had no heart for a fight. The goblins had already shown themselves to be as treacherous and vicious as any black-hearted pirate on Golarion’s seas, anyway. The Man’s Promise now sailed under a new captain, Captain Spack Jarrow. Brodo Faggins was made 1st Mate, Ent Cleastwood was 2nd Mate. Garagornne was appointed to be the new Bo’sun, and Shahn Dook Pizzard would be the Bo’sun’s mate. Man’s Promise bears down on a bag of Wild Cheetos. My preference for 3.X/Pathfinder over Basic D&D is not a huge divide; it’s more like splitting hairs. They’re almost tied for second place, with AD&D 1st edition in a close third. Of course, since the group drifted away from the original purpose of the Doctor StrangeRoll campaign, this discussion is a little moot (particularly since we have yet to play ANY incarnation of AD&D as a group together). I just didn’t want to forget the roots of this blog, as set out in the very first post. Disclaimer: I am not a competition-quality painter. My skills are OK for table-top use, but I won’t be entering any contests any time soon and there are definite areas in which I need practice and improvement. Also, I apologize in advance for any wierd formatting issue that occur due to the number of images. I still haven’t got the hang of how WordPress deals with multiple images in a post, particularly if I want to have them side-by-side. It looks like it worked! Bond time was not instant, but the pieces fit together tightly enough that it’s not an issue, and the piece has sufficient strength for tabletop play. Perfect! Now onto the paint job. 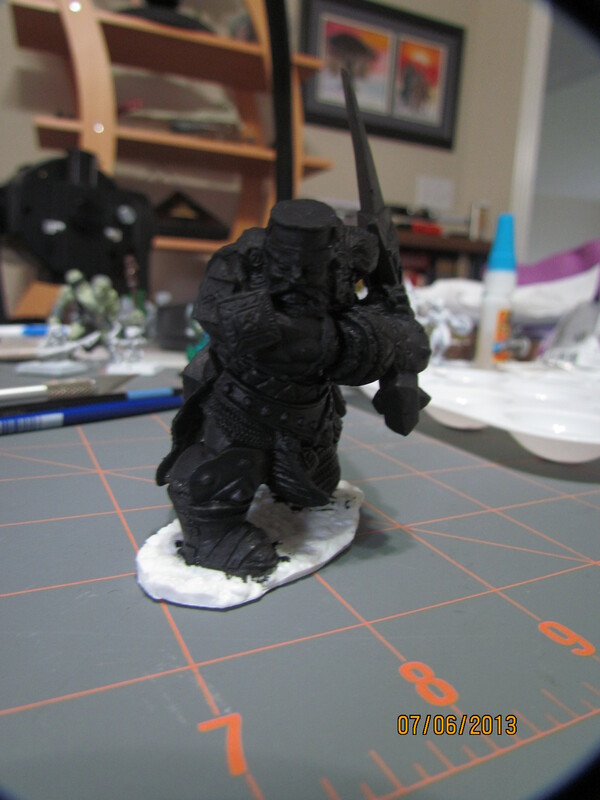 According to Reaper, one can paint on Bones miniatures without priming them first. From what I’ve read, this really only works if your base coat is NOT diluted. 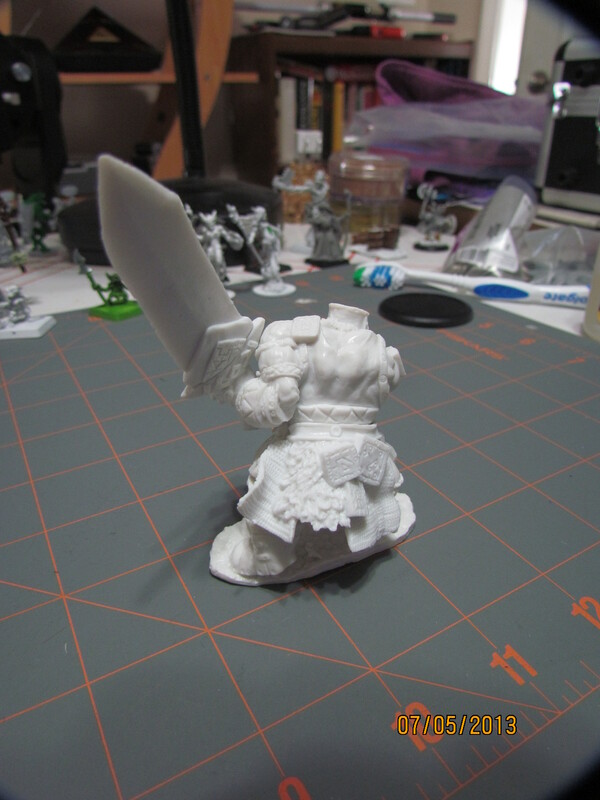 This is a really large miniature so I’m going to prime it anyway, then base coat. 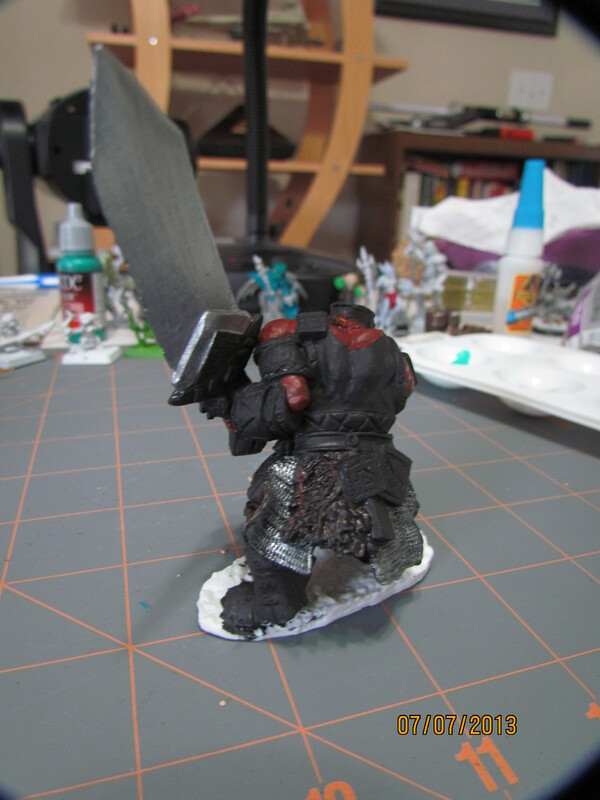 I’ll wash the miniature first, of course, to get rid of any residual mold-release goo. 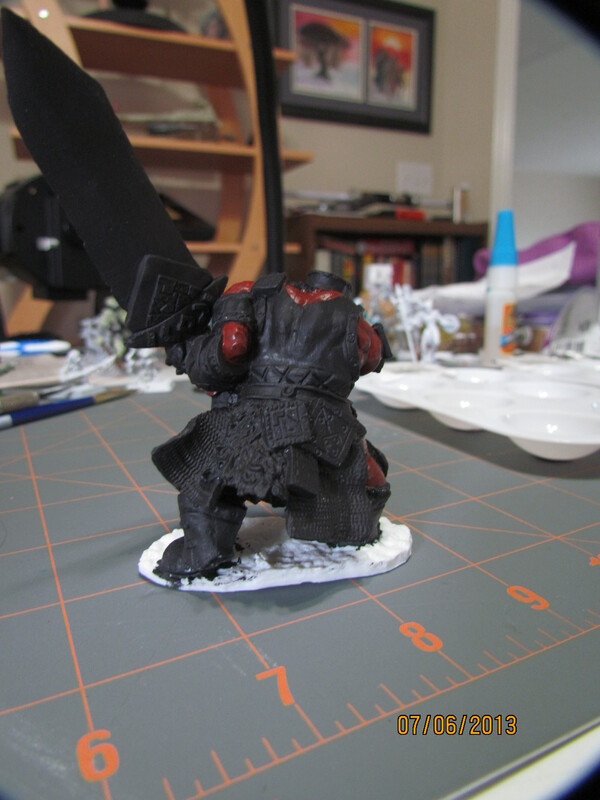 Priming, as always, lets some of the details really pop. 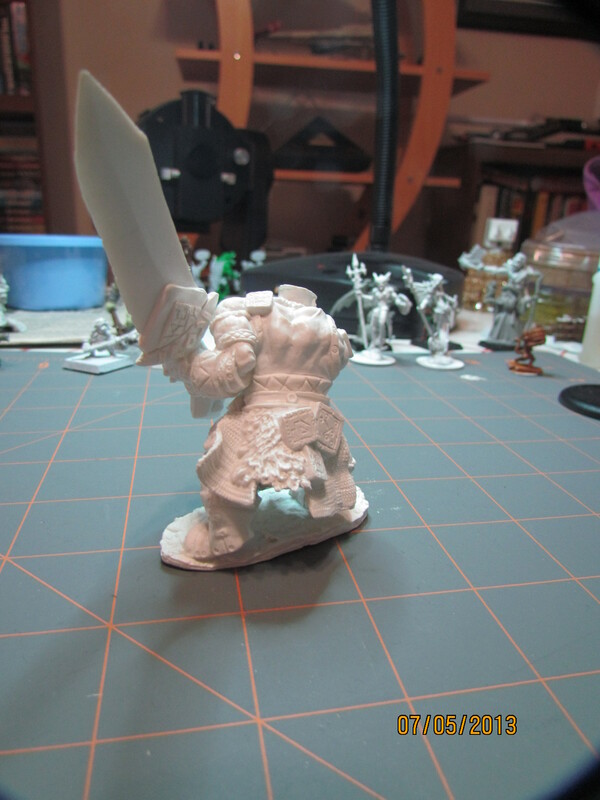 Unfortunately, the primer I used, light grey Rustoleum Clean Metal Primer, is NOT suitable for Reaper Bones miniatures (works great on metal minis, though). It never really dried and remained tacky despite drying overnight in a dry, well-ventilated area with good air circulation. Fortunately, odorless paint thinner, such as my wife uses for oil painting, got most of it off and appears to have removed the last vestiges of anything tacky. 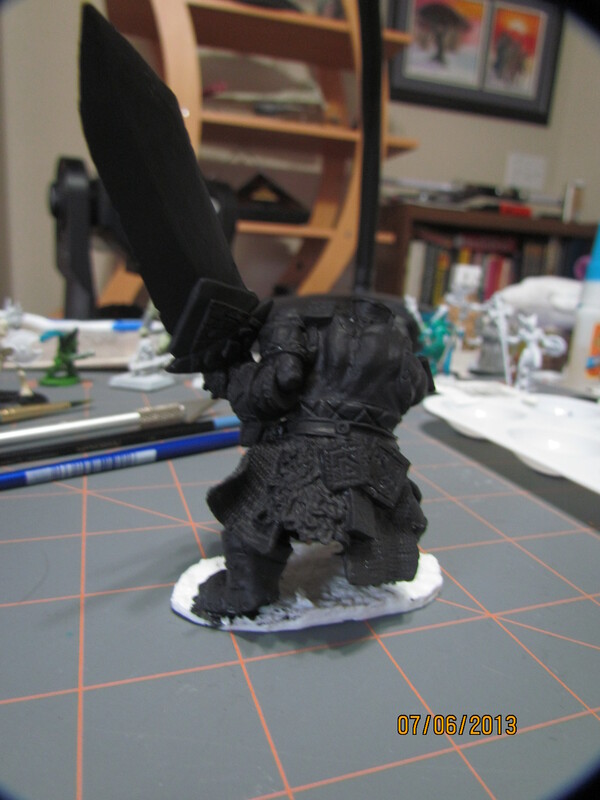 I will attempt to paint the mini directly, then. I’m really glad I didn’t try the dragon first. 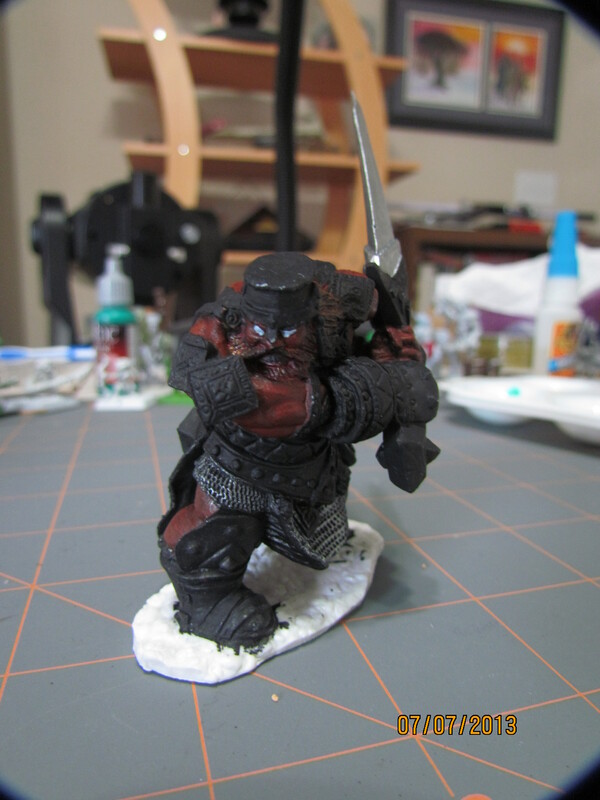 Since the Fire Giant Warrior I selected is fairly large, I decided to not use my regular miniature painting paints for the base coat. I wasn’t worried about quality, rather, I was worried I wouldn’t have sufficient quantity. Fortunately, I had some DecoArt Americana Acrylic Paint handy. I used Lamp (Ebony) Black for the base coat. It went on great. When wet, it looked like it was going to obscure all the details. My fears were assuaged when it dried, however. Next, I painted the flesh tones. I used a dark flesh tone. I was going to go with Terra Cotta, but it looked too red. 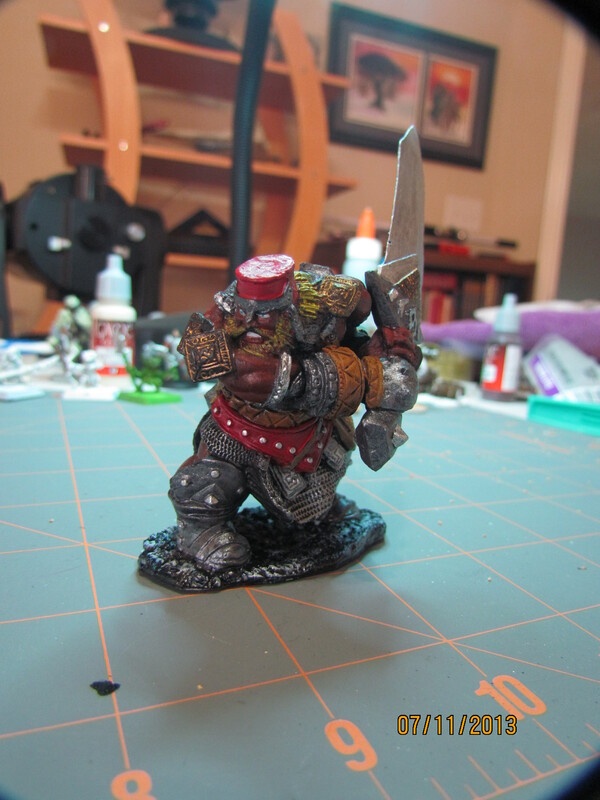 I dry-brushed the chainmail and did a brown wash on the furs and a red wash on his hair (I want to give the appearance that his hair is fiery. This didn’t really work as well as I’d hoped. Perhaps my wash was not thin enough. Anyway, I pressed one, dry brushing with orange, then yellow. 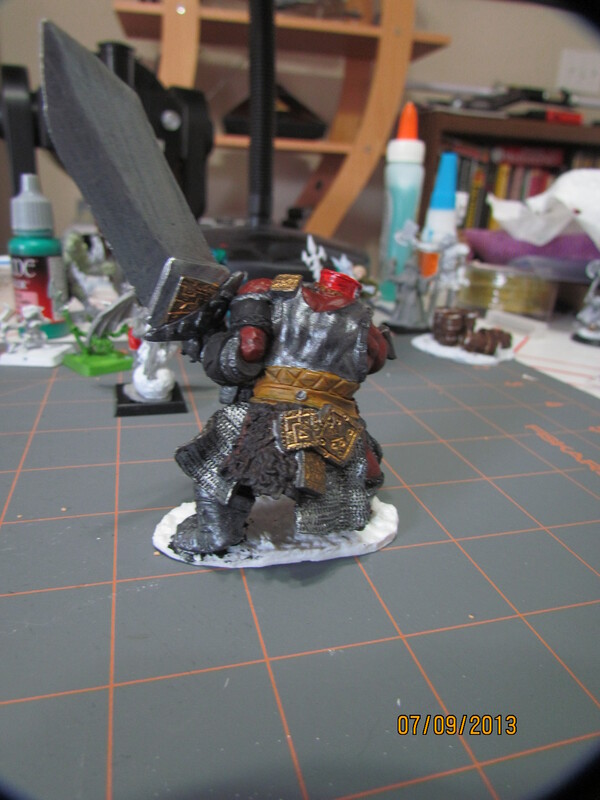 I also slapped some thinned gold paint on the various decorations and painted the armor, sword and other steel bits. I decided to make his helmet and girdle red. For some reason, the red paint acted like it was too thin, even though I did nothing to thin it out. I’ve noticed some of my Vallejo paints act like this. Maybe I didn’t shake the bottle enough (they tend to spend months not getting used). To finish him off, I need to fill in the details. 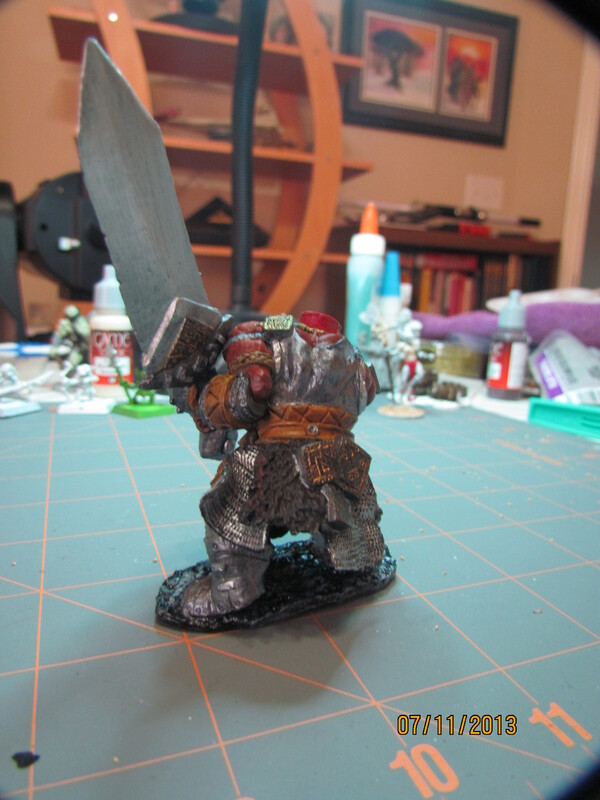 When I got all the leather painted, I did a wash with smokey ink. 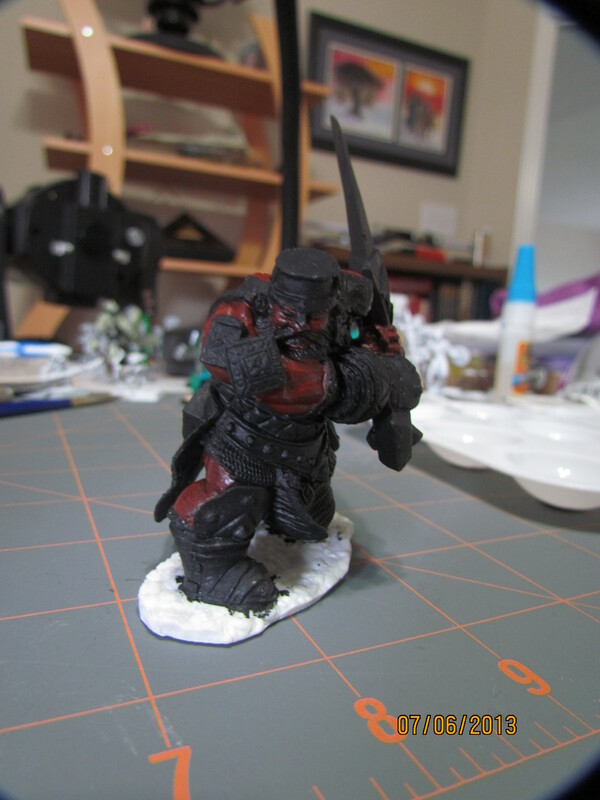 I also put a layer of a darker red on the helmet and girdle. It worked much better and didn’t look quite as much like a bright red light on top of his head. I always have trouble with faces and hair, especially if I try to add layers and depth to the hair, as I tried here (I wanted to give the idea that his hair was fire). It didn’t work out as well as I’d hoped, but at some point, I needed to just stop and call it done. So, it’s done. 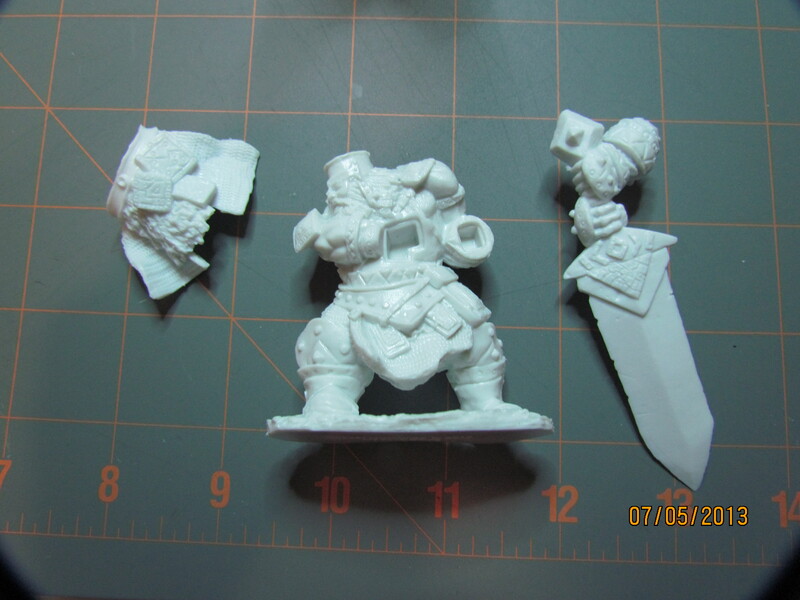 Last year I participated in a Kickstarter run by Reaper Miniatures; the Reaper Bones Kickstarter. 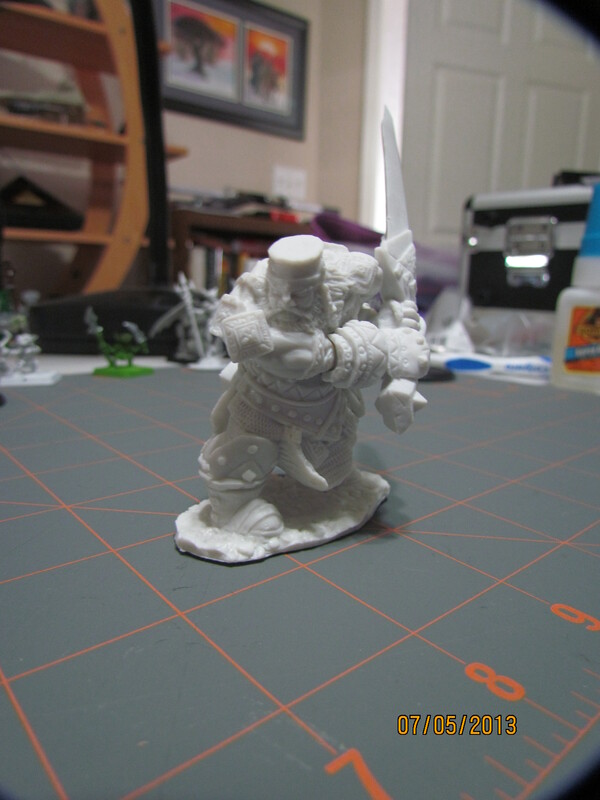 On Wednesday, my miniatures arrived. You can see in the second picture, one of the opened storage cases (far right), the Vampire-backer level box (right center), the add-ons (left center), and Kaladrax the Reborn (far left). Kaladrax, when assembled, is going to be about the size and weight of my cat. 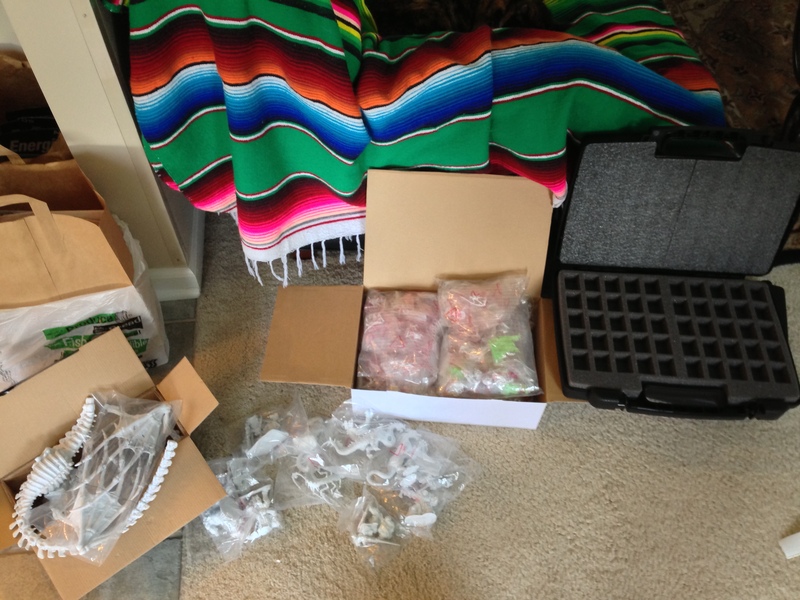 The box with the Vampire-backer minis contains 236-ish miniatures. I added on an additional 8 including Kaladrax (and mistakenly ordered a second set of Storm Giants). Unfortunately, my Clockwork Dragon did NOT show up. 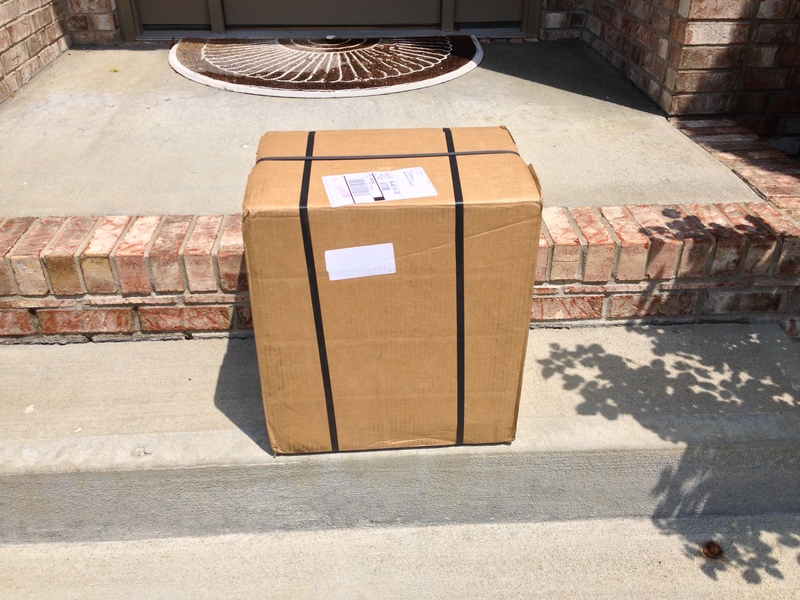 Obviously, it was an error in the packing process and I’m sure Reaper will take care of it when they have time. It’s REALLY unfortunate because that was one of the ones I was most looking forward to seeing. Ah well, it just means I’ll be having another good mail day in the future. It is truly an insane amount of miniatures. I’ve only unwrapped a couple of the miniatures at this point because I don’t want to feel overwhelmed with the amount I have to paint. Also, I want to try a blogging experiment. 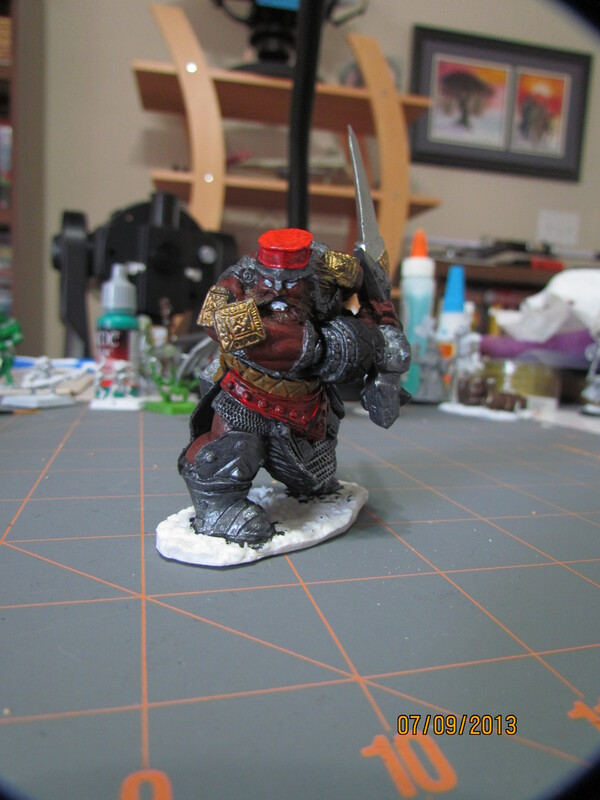 One-at-a-time, I will pick a miniature (sometimes I’ll pick a specific one, other times, I’ll just reach in and grab one), assemble it if neccesary, then paint it and blog the results. This might encourage me to actually paint a significant number of them. It might not, but I’m going to try. 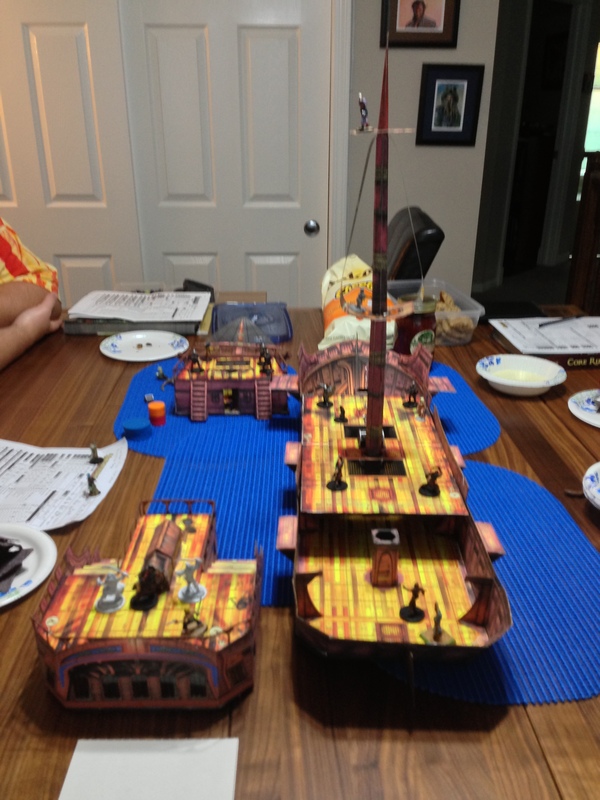 Goblin Skulls & Shackles, Session 5 – We Be Pirates! “The Poop Deck is the one with the aft hole.” – words of wisdom from “Captain” Spack Jarrow, goblin pirate. With the boarding training complete and the Wormwood on the prowl, the crew were put back to work. Mister Plugg seemed to take particular interest in making sure the goblins got the worst jobs on the ship. After a day or two of this, he decided the goblins mistakenly referred to as “Sean Dook Lasard,” actually Shahn Dook Pizzard, needed to help out in the bilge with two other sailors. He and Master Scourge made a point of searching him for concealed weapons, but since he cleverly attached a mop head to the end of his quarterstaff, they were none the wiser. While Shahn Dook worked the bilge pump, he noticed the other two sailors were concealing weapons. One of the sailors accused the goblin of slacking off and the other maneuvered behind him, drawing his weapon. Shahn Dook was prepared for treachery, however, and used his druidic magic to summon a magical shillelagh, with which he made short work of the two humans assaulting him. He took the hand axes the humans had and tried to make their wounds appear as though they turned on each other. Mister Plugg was incensed and accused the goblin of murder. And for that, there was only one punishment: a day in the sweatbox followed by keel hauling. The next day proved to be lucky for Shahn Dook Pizzard, though, as sails were spotted on the horizon and after a brief period, the Wormwood began its pursuit. Shahn Dook was released from the sweatbox as the ship would need all hands for the inevitable boarding action. The ship in the distance was slower than the Wormwood and by the next day, they were hard astern, ready to engage. Captain Harrigan ordered half-a-dozen pigs slaughtered and thrown into the water. 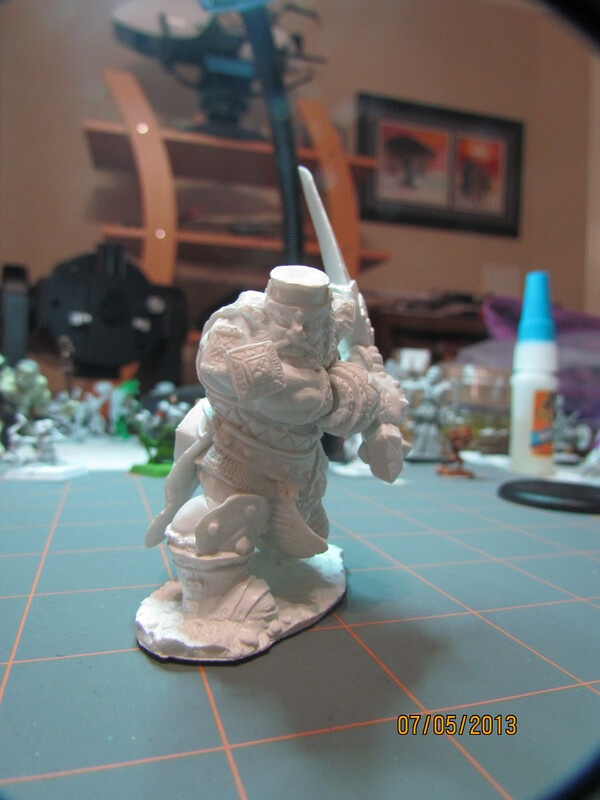 The Gunnery Master, Riaris Krine, took the goblins aside and gave them their orders for the upcoming battle. They were responsible for securing the sterncastle and the aft dinghies; no one was to leave the ship. As the ships closed and the arrows and crossbow bolts began to fly, Shahn Dook leapt overboard and swam to the other ship, Man’s Promise, sharks attracted by the chumming in hot pursuit. The rest of the goblins waited until the ship was in range and threw their grappling hooks. The battle was joined! The goblins, Shahn Dook included (he managed to avoid the sharks out for blood), climbed onto the sterncastle. They engaged the crew manning the wheel as the rest of the Wormwood’s crew made their way onto the ship. The goblins proved formidable opponents and the crew of Man’s Promise offered little in the way of challenge for the Wormwood Pirates. After seeing Captain Harrigan walking around with their captain’s heart in his hands, they surrendered. Captain Harrigan took Man’s Promise as a prize and offered the surviving crew a choice: join his crew or die. To emphasize his point, he grabbed one of the defeated sailors and threw her overboard to the sharks. Her screams were incentive enough and the remaining crew of Man’s Promise joined the Wormwood. Mister Plugg and Master Scourge were given Man’s Promise to sail to Port Peril to sell. A skeleton crew was selection to crew the ship: Shahn Dook Pizzard, Garagornne, Ent Cleastwood, Brodo Faggins, and Spack Jarrow were among those selected. Of the officers, only “Fishguts” Kroop was sent along. They prepped Man’s Promise to make way as the Wormwood went on her way. Man’s Promise followed, under stricter rules than the crew was used to. No one was allowed above deck in the evenings, there was no grog, no gambling, and no singing. When the Wormwood disappeared over the horizon, Mister Plugg ordered a new course, one that was not on the way to Port Peril…. About half the crew assigned to Man’s Promise turned out to be sympathetic to the PCs and the other half is relatively hostile, so it should cause some good tension in sessions to come. By this point in the 4E campaign, I was already frustrated with the system, and though Pathfinder is complex, I’m finding it easier to play. Perhaps it is because I DMed 3.X throughout its entire product cycle and Pathfinder is close enough to that. 4E was different enough that I felt really unfamiliar with it and at times, I felt as a GM, that I was not entirely necessary for the game. The next session should see them finally get off the ship for a bit. A ship will always be part of this adventure path, but it will be nice to stretch the legs, as it were.